When Disney makes a movie about Nature I always want to see it. They make great movies! Chimpanzees have been something I have loved watching on nature shows since I was little. The way the interact as a family and are individuals is fascinating. When we go to the zoo my son and I watch the Chimpanzees for the longest time of any animals we see. To see them in a wild environment like the movie Disney Nature Chimpanzee was amazing. The star of the movie is Oscar. He is a little chimp with his mama. This movie is about the adventures of little Oscar and his family in the jungle. Note: Some parts did make me cry! :) I was amazed at the clarity of this movie. It was like you were there! I giggled a bit to hear Tim Allen as the voice over, for me he is Tim the Toolman Taylor lol. I would have maybe liked a different person to voice over but thats just me. My son liked the "monkey movie" as he calls it. I told him they are Chimpanzees and he just looked at me and said "Mama its Monkeys". I love that he likes animal movies like I did as a kid. From Disneynature, the studio that brought you “Earth,” “Oceans,” and “African Cats,” comes “Chimpanzee” — a remarkable story of individual triumph and family bonds. Journey deep into the African forest and meet Oscar, an adorable young chimp with an entertaining approach to life. The world is a playground for little Oscar and his fellow young chimps who love creating mayhem. His playful curiosity and zest for discovery showcase the intelligence and ingenuity of some of the most extraordinary personalities in the animal kingdom. Stunning hi-definition images bring you up close and personal as Oscar and his family navigate the complex territory of the forest. It’s an inspiring and life-changing adventure that overflows with courage and charm. And it will capture your heart. 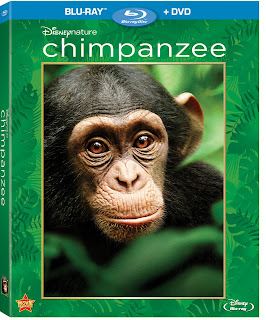 • “See ‘Chimpanzee,’ Save Chimpanzees”—This feature details the “See ‘Chimpanzee,’ Save Chimpanzees” conservation program and how for every copy of the film purchased until August 27, 2012, Disneynature will make a donation to JGI to protect chimpanzees today and tomorrow. The feature also includes an interview with Dr. Jane Goodall, DBE, founder of the Jane Goodall Institute and UN Messenger of Peace. • Disney’s Friends for Change—This feature highlights Disney's Friends for Change, a program that showcases steps that kids and families can take to make a positive impact on the world and the people and animals that live there. • Disney’s Conservation Legacy—This feature provides a look at the conservation efforts that Disney sponsors around the world. • ON LOCATION: THE MAKING OF “CHIMPANZEE” is a series of exciting short features that delve further into the incredible lengths the filmmakers went to tell the story of Oscar and his chimpanzee family. o 30 Years in the Making—The story of the team of researchers who have been observing chimpanzees in the Ivory Coast for 30 years. 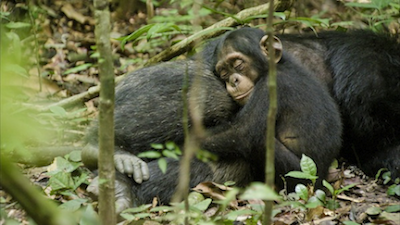 o The Heart of the “Chimpanzee”—A behind-the-scenes look at how and why the film was made. o Piece of the Puzzle—A cameraman’s two-hour daily trek through the forest to get to the chimpanzees. o Don’t Blame the Tool—An observation of the chimpanzees’ daily lives and how they use rocks as tools to prepare their food. o Scar’s Army—An inside look at the struggles between the film’s two rival chimpanzee groups who share the same forest home. o Camp Invaders—A featurette on all the creepy, crawly creatures found at the filmmakers’ forest camp. o Forest of Bees—A feature detailing how the crew spent two days wading through a sea of bees that inhabited their filming location in order to capture 20 seconds of footage. The conservation program tied to the theatrical release will help protect 129,236 acres (202 square miles) of wild chimpanzee habitat through infrastructure investments in the expanded Tchimpounga Nature Reserve in the Republic of Congo (Congo); educate 60,000 schoolchildren about chimpanzee conservation; and provide food and medicine for nearly all of the orphaned chimpanzees at JGI’s Tchimpounga chimpanzee sanctuary for at least the next year. Disneynature will contribute $.50 to the Jane Goodall Institute for the Disneynature Tchimpounga Nature Reserve Project per Blu-ray DVD Combo Pack and Digital purchase through August 27, 2012, with a minimum of $30,000 pledged to this program. Information concerning the Jane Goodall Institute can be obtained, without cost, by writing to JGI, 4245 North Fairfax Drive, Suite 600, Arlington, VA 22203, or by calling 703-682-9220, or by visiting www.janegoodall.org. This purchase is not tax deductible. You can order a copy of Disney Nature Chimpanzee online at the Disney store.